Sony A35 work sample shot. Below is a sample shot from the new Sony A35, (review here) which I've been using and reviewing this past month. This sample shot is indistinguishable from the A900 shot at medium to small sizes. At full resolution there are differences noticeable between the two, possibly due to the different lenses used; the CZ 16-35mm was used for the A900, the Sigma 10-20mm F/4-5.6 for the A35. This room has an ugly parking lot visible through the shutters, that's why they're closed here. I could've swapped the window view, but sometimes that's not appropriate. I liked the look of the wood shutters, and thought that closing them and highlighting them made perfect sense. I took alternates too, but I happen to like this shot best, that's why I'm showing it. In addition to the lamps, I used seven supplemental lights to highlight the bed, chairs, shutters, table and night stand. Since there is no outside light to use, and build on, I had to use two flashes bounced at full power to give me my base exposure. In the end, it doesn't make any difference as far as what camera is used, any DSLR could produce similar results, even 10 year old ones, or 50 year old film cameras if you're nostalgic, and careful. Supplemental lighting is the key here, that's where you want to spend your time and money if this is the kind of photography you want to do. I like the room, but the lamps have CFLs in them, I hate those lights because of the slightly greenish light they give off, and should've replaced them with incandescents, which I normally have, but I didn't carry them for this shoot. I also think the bedspread could've been a little more interesting, but that's beyond my responsibility. Specs: Sony A35, Sigma 10-20mm F/4-5.6, 16mm (24mm equiv), F/7.1, 1/13sec, ISO 200, manual white balance. Old Minolta zoom lenses prices from way-back. Here are some list prices for most of the popular AF Minolta zoom lenses from the 1980s and 1990s. The prices below were culled from period publications, and receipts sent in by readers; see the 8/21 entry for the prime lenses. I have a couple of ads from a large NY city camera discount house, (not shown, but probably B&H photo) that has prices that are significantly lower than what you see below, I'll sort the prices out and post them soon. I'd guess the actual street prices of the lenses in the US would be 10-20% south of the lower price figure. Sony NEX-5N in stock, and another work sample shot. B&H Photo has the wildly popular NEX-5N body-only in stock, as well as the regular kits and new accessories. I'd get the 5N over the 5 or the NEX-3 series. Below is another work sample using the consumer grade Sony A580. I use this camera when the client doesn't have a need for huge enlargements, such as this spec house job highlighting the homebuilders interior details for a promotional website, not for print. This scene has massive natural light from two huge windows, one in back and to the right, the other on the left side. There were no curtains, so I had no control over the outside light, which 'flattened' or wiped out the contrast in the cabinetry and chair. 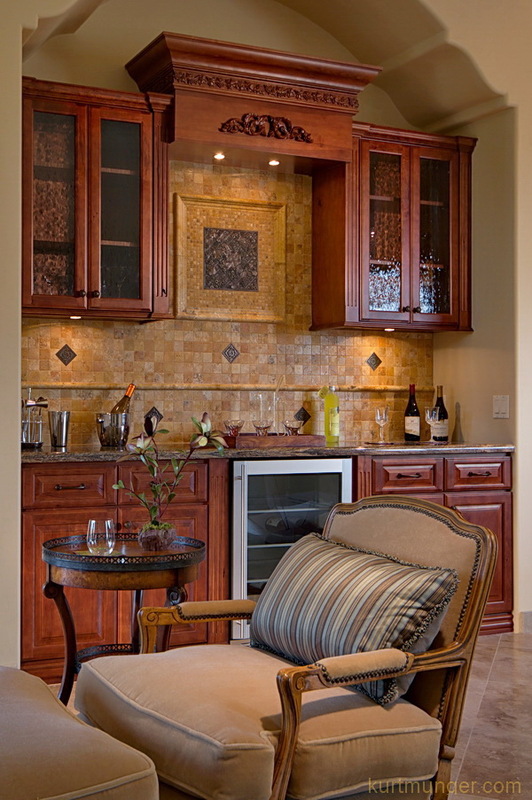 My hard work this day was trying to use supplemental lighting to bring back the details in the cabinets and chair. Here I 'raked' light across the wood at a pretty hard angle, generally from the left to the right, and from top to bottom. I also used a flash with grid to provide a little bit of light behind the small round table to make it stand out against the lower cabinet. I did the same thing on the upper cabinets, but had to drop those in later (post processing) as it caused harsh shadows on other areas. Finally, I hand-held a flash high up over the chair in the foreground to make it 'pop' with some much needed contrast. This image is a tight crop from the original; there's a small wall niche to the right with a neat floral arrangement, but I wanted to post the image this way to provide more details for my quasi tutorial. I used about 4-5 bare flashes for this shot, no umbrellas or gels, and lowered the exposure and WB to make it more 'evening' like. An interior designer added the props. Specs are; F/7.1, 1/8sec, 20mm (30mm FF equiv) ISO 200. SanDisk card deals and Sony mounting bracket. I see some big instant rebates on memory cards from SanDisk. Check out the two-pack 8GB, $39.90, or the two-pack 16GB card for $62.98, that's less than $32 each, I paid $53 (each) for my (same-speed) 16GB MemoryStick cards a few months ago! For heavy RAW and video shooters take a close look at the 32GB cards, $109.90 for two. There are great deals on CompactFlash cards too for you A700/900 shooters. The bracket for mounting items like the Sony CLM-V55 to your camera when your camera hotshoe is in use by another devise is now available, it's called the VCT-55LH mounting bracket with accessory shoe. Click the image below for the complete SanDisk sale. New price updates, and bogus testing of A900 to A77/65. I've fully updated all the new and used prices on the lens review pages and price guide. The prices seem to have stabilized on the used market this year, so most items are marked 'steady' in the 'trending' column. There are a few of exceptions, like the Sony 20mm F/2.8, which seems to be getting more popular as time goes by (because it's a very good lens), and two Sony discontinued flashes, HVL-F56AM and HVL-F42AM. Both Sony flashes were a good buy before they were replaced. I see a couple of test chart comparisons of the A900 against the new A77/65, unfortunately, these tests mean nothing because the testers or reviewers are using two different lenses at two different focal lengths, at different apertures, using jpegs, all the while taking close-focus images of a test chart or color checker. This type of testing makes no sense, you're not comparing apples to apples. Test charts at close focus are great for macro lenses, poor for prime lenses, and really bad for zoom lenses. The reviewers are using the zoom lenses to try and make up the difference for the crop factor of the A77/65. My advise to those reviewers would be to compare the two cameras using the same wide angle lens focused at infinity---a wide lens is used so you aren't too far from the subject, and eliminates atmospheric problems. Use the exact same focal length, do not adjust for the crop factor. Take your shots by moving the cameras forwards or backwards, whichever you like, until the capture area is identical on each camera); set the aperture to F/5.6 or F/8 and take the crops from the centers only, as the sides can look far different from different lenses, and at different zoom lengths. Use a tripod and timer, and turn off SteadyShot. Use manual focus and bracket your focusing so there is no question about the shot being in focus. Also, shoot RAW to minimize any differences in jpeg processing. Testing in this way will result in a more accurate comparison (although not perfect), but most testers aren't photographers, their only concern is new technology, and they never bother to learn how to make good pictures or properly compare cameras, it's all about the chatter. So there's my mini rant of the day folks! More A35 stuff to come, including some samples from a real photo shoot! When is 'wide' too wide? This image is from the Sony A700; yes I promised to stop showing stuff from that 'old' camera, but I thought this picture could help illustrate the difference between wide, and too wide. The shot below was taken several years ago shortly after I bought the Sigma 10-20mm F/4-5.6 lens. Prior to that point I had been using the Sony 24-105mm F/3.5-4.5 with the A900. This image is too wide in my opinion. Like most people, after I bought that Sigma 10-20mm ultra-wide lens I thought it was really neat to take pictures at 10mm, that's a big mistake. 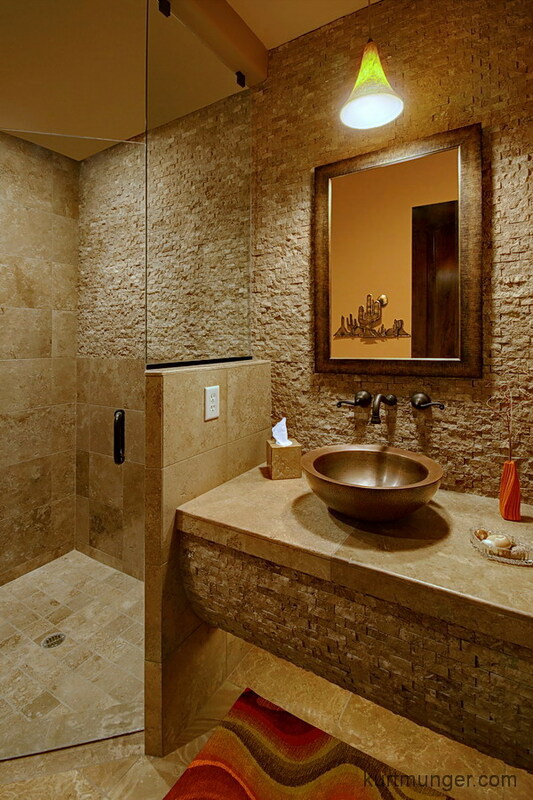 This tiny bathroom is rendered nicely here, and the client was very happy, but the hard convergence to the left produced by using a super wide focal length of 10mm (15mm in full frame terms) bothers me, do you notice it or not? Does it bother you? There were no flashes used for this shot, it was a three shot HDR if I remember correctly. It could've used some supplemental lighting, but I wasn't skilled at off camera flash at the time. I cloned out a light in the shower stall because it was oblong from the corner rendering, and I used some simple shadows/highlights adjustments to complete the final image. 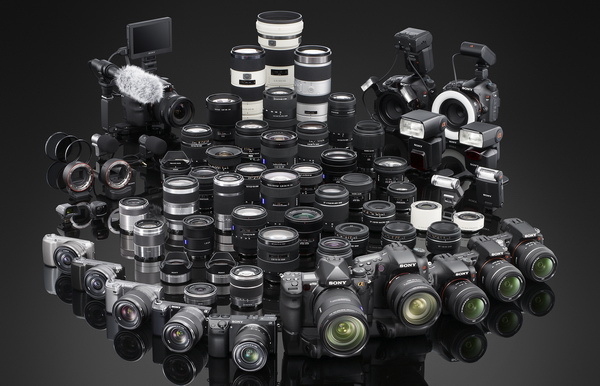 Massive Sony price increases on most lenses. Sony has increased the prices on most of their full-frame lenses, up about 5-15% depending on model. The more expensive models were raised about $200, like the 70-200mm, 70-400mm and 24-70mm, although the uber-expensive 300/2.8 did not get bumped up. Camera body prices seem to be unchanged for now, as are the NEX lenses and most "DT" lenses. If you have five minutes to burn, check out this surfing video from the Billabong Pro Tahiti (Teahupoo) event this past week. 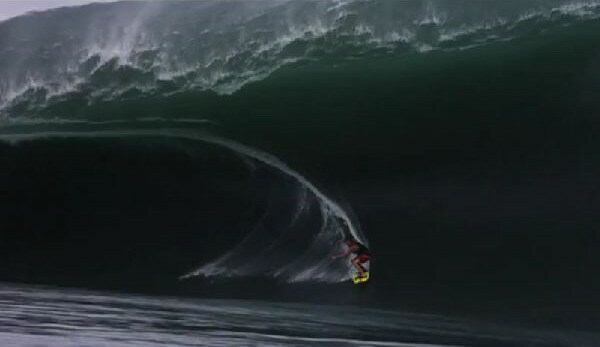 I don't normally watch surfing, but this footage is pretty crazy, especially in the middle. If you want to see a condensed version of this with mostly big waves, go here.